A teacher in Visalia, California, "forcibly cut a student's hair off" while singing the national anthem of the United States of America. College of the Sequoias police responded Wednesday to a University Preparatory High School classroom after reports of child endangerment involving a teacher and a "pair of scissors," said Police Chief Kevin Mizner. Science teacher Margaret Gieszinger, 52, of Exeter, was later arrested on suspicion of felony child endangerment. Her bail was set at $100,000. 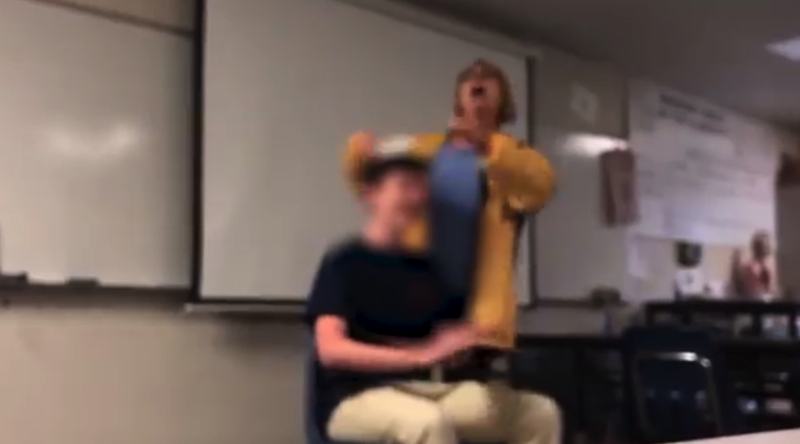 The arrest followed two videos posted to social media on Wednesday showing a student sitting in a chair at the front of the classroom as the teacher cuts off portions of the student's hair. She then tosses the chunks of hair behind her. The video must be seen to be believed: a found-footage horror movie depicting her lurching, scissors whirling, at screaming children. She was arrested on suspicion of corporal injury to a child. There's more coverage here, with a different cut of the footage.